The ways in which customers find, research, buy and advocate products and services have changed completely in the past decade. Three years ago, retailers would never have thought customers would use their large and expensive brick and mortar stores as product showrooms; simply reviewing the merchandise and then going home and purchasing online from a cheaper competitor. Yet, this practice of showrooming is becoming more and more commonplace today. And, retailers are not alone. Banks, hospitals, government agencies, insurance firms, and auto dealerships to name a few, all face big changes in the way customers will interact with their businesses in the years to come. For brands today, the importance of knowing who their customers are and how they buy, seamlessly moving in and out of offline and online worlds, has never been more essential. What was once a straightforward path to purchase has become a dynamic, non-linear digital customer journey. One question keeps being tabled at executive level meetings with many of our clients: Is our business connecting with today’s digitally empowered customer at the points that are most critical to them? Undoubtedly there are more opportunities than ever before for organizations to connect with and engage customers. And, when it comes to creating a digital customer experience strategy, we believe brands need to ground their approach in a deep understanding of customer behaviour. 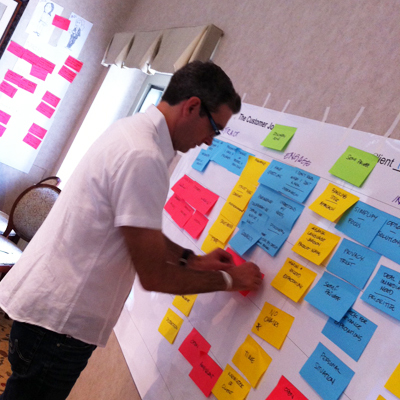 We’ve been working with some of our key clients in insurance, health care, banking, retail and media to help them do just that through our Customer Experience Mapping program. One example is our work with St. Michael’s Hospital Health Design Lab on addressing the unique needs of diabetes patients at each stage of their journey. You can read more about this project here. Although this example is in the health care industry, we can apply the same customer experience mapping approach across verticals and industries. CX Mapping is an incredibly powerful tool to help organizations identify and eliminate hurdles in their customers’ path to purchase and to innovate and improve their customer experience. This in turn is driving new revenue and operational efficiencies, while enabling those brands to differentiate themselves in the marketplace. With a customer experience map in hand, you will learn not only how your customers are moving through this new path to purchase, but why they make the choices they do and how they feel about the experiences you deliver. The process also identifies pain points in the customer journey and uncovers how you can leverage new, emerging digital technologies to address those issues and optimize the customer experience for the future. If you are trying to determine if your brand is connecting with today’s digitally empowered customers, then I suggest checking out our unique approach to CX Mapping. To find out what Delvinia’s customer experience experts are saying about CX Mapping, download a copy of our eBook, 9 Questions Clients are Asking Us About Customer Journey Mapping. You can also find more information in these related blog posts, Using Social Media Listening to Humanize Customer Journey Mapping and The Journey is only part of the Experience.